The first 5 years of life – the pre-school years – are vital for a child’s brain development. In particular for a child’s ability to focus, and to fully develop his or her memory and cognitive skills. Indeed, researchers say that the brain is so important that nutrients from the diet are first taken up by the brain, before other organs. We looked at over 100 research studies from universities like Cambridge, Exeter, Harvard and Berkeley to establish the top 10 brain building foods that should feature in your child’s diet. The brain is a fatty organ – so healthy fats are important. Fish like salmon contain Omega 3 fatty acids essential for healthy brain growth and mental skills. 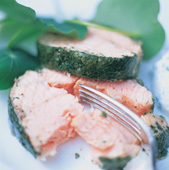 Serve salmon grilled, fried or baked, in fishcakes or add flaked canned salmon to a pasta bake. 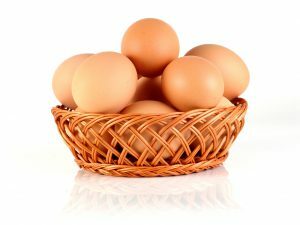 Eggs are a high-quality source of protein (and fats). They also contain choline, an important nutrient for developing memory and thinking speed because it’s a building block for a key neurotransmitter. Scramble, boil, poach, make omelettes or pancakes, or try cheese on toast with a fried egg on top. Delicious! A full fat Greek yogurt with intense coloured fruit like raspberries, strawberries, blackberries or blueberries tastes deliciously creamy – it's a great combination. 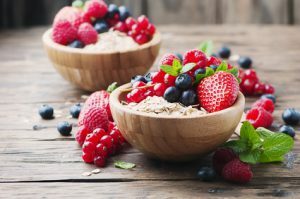 The fruits contain not only vitamins but various flavonoids – plant nutrients that strengthen the connections between brain cells. 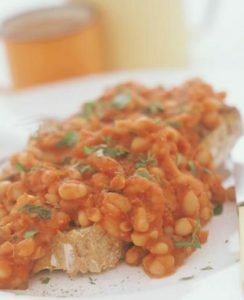 The humble – and popular – baked bean is a great source of sustained energy, protein, minerals and fibre. 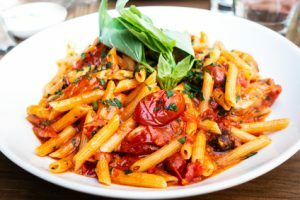 And the tomato sauce adds lycopene, an important anti-oxidant nutrient that is brain protective. Beans on wholemeal toast is not the only option – you can add cold baked beans to a salad. Add some chopped vegetables into soups or spaghetti sauce. Many children prefer stir-fry vegetables (especially if you add tomato sauce) and add some nuts or seeds for a more interesting texture. Vegetables provide many essential minerals and vitamins like folic acid and magnesium. 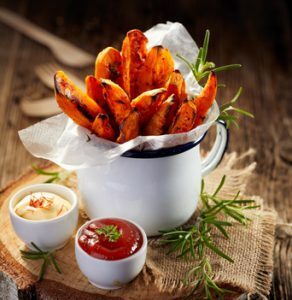 Kids love chips – so try making sweet potato fries. They taste just as good as potato chips but also contain beta carotene which is a brain protective antioxidant. You can even make an alternative to potato crisps out of kale, spinach or chard, as well as the more familiar parsnips, beetroot and sweet potato. For leaf crisps, cut the stalks from the leaves, spray with olive oil, add some salt and bake. Really tasty! 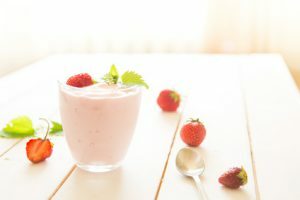 Experiment with veggie smoothies – start with a carrot and tomato base and try adding spinach, rainbow chard, broccoli and even fruits like mandarins and strawberries. 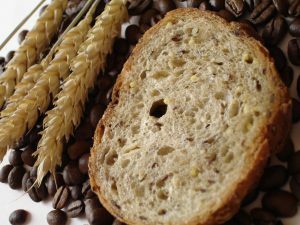 The brain runs on glucose and the carbohydrate in wholegrain cereal and bread gets converted at a sustained rate to glucose – keeping up mental and physical energy levels. Wholegrains are a good source of B vitamins, vital for the nervous system and to convert food into energy. They also contain vitamin E, which helps protect the fatty membranes of the brain and zinc which helps mental alertness and memory. Oats are a special whole grain. They contain heart healthy beta glucans and provide sustained energy. There are low-sugar packaged oat cereals, and in the winter, porridge with maple syrup is a great breakfast. 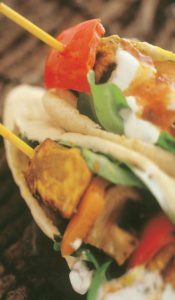 You can add some nuts, banana and other fruit for an interesting texture change. Try adding some dried oats to a smoothie to thicken it up. It’s not usually a problem to get children to eat peanut butter! So it’s good that it’s a healthy source of fats, vitamin E and thiamine (vitamin B1). Makes an interesting addition to a smoothie. 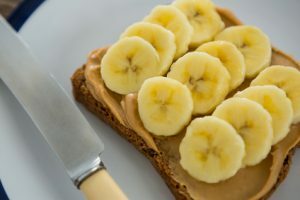 My kids loved peanut butter and banana sandwiches – the banana adds brain-friendly potassium. Meat is a good source of minerals like iron and zinc. Zinc helps regulate communication between nerve cells including brain cells. Iron aids in delivering oxygen to the brain and is better absorbed if the body is well supplied with vitamin C. The brain is very hungry for oxygen. It’s less than 5% of your child’s body weight – but consumes 20% of oxygen intake – another reason why exercise is so important for brain development. The brain is not just a fatty organ it’s also 73% water. To keep up attention and energy levels, make sure they drink plenty of water – NOT sugary drinks. But ideal early years brain development is more than healthy food. A rich and stimulating environment in the first 5 years of life is vital to build the billions of connections between brain cells, which is the physical basis for intelligence.